I haven't said anything about this yet, but, it's time. I'm a working woman again. I took a job - it could just be the perfect job for me - at a craft store. It's weird to work again and while I'm only working part time, it's totally an adjustment both physically and mentally. The cool thing about it though is that I'm mostly working the fabric department and you know, for the most part, crafters are really nice people. It's fun to chat about their upcoming projects and I love the people that are so excited about what they are making that they want to share and show. More than once I've had a customer whip out a photo or a completed sample to show me. One lady was making a skirt she saw on Pinterest and another was making a wreath. It's pretty cool to see the creative process from this point of view. Usually I'm the one creating but now I'm on the other side, the support side, in a way. One thing I've noticed is that when a good idea pops up, it seems several crafters are all ready on it. I had 4 different ladies show me their projects. 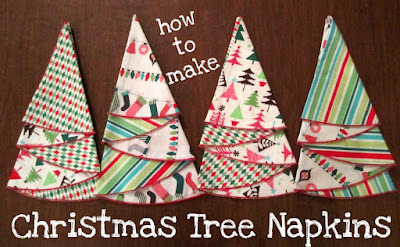 They weren't shopping together or even friends, yet all of them were making napkins shaped like Christmas trees. Have you seen them? I had not either. I'm not sure I will make these, my project to-do list is pretty long already, BUT, I do like the idea and thought it was worth sharing. And, in other news, I'm not working for the rest of the week so the tutorial for Mary will be up tomorrow. I think these are to cute! Thanks for sharing.